During the many years that I have been producing this little newsletter of mine, I have always tried to have each issue contain a good balance of items. There is usually a 'main' story or two, usually also a regular feature or two, and the balance taken up with a sprinkling of 'news' items. This issue is different. There is so much going on here these days that I am going to need almost every single page just for the news! This issue really is going to be a news-letter! As you will see, the items are divided between those that discuss my own printmaking work, and those that involve activities of Mokuhankan, my publishing venture. And that reminds me that there is something I wish to ask your advice on. Since the autumn of 1990, when issue #1 of this newsletter was published, the title has remained unchanged. But now that the scope is becoming wider (involving those publishing activities) it is time to think about an 'upgrade'. As the current name is only understandable in Japanese, it would be better to have a name that made sense to all my collectors, not just those here in Japan. Any ideas? I'd love to hear any suggestions you may have! Even though we will be talking about the work of a lot of other people in this issue of the newsletter, I'm going to be selfish, and start with myself! 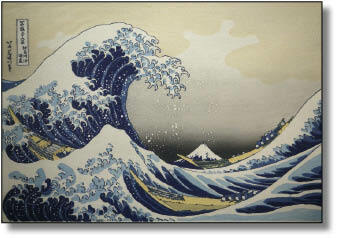 My current series - The Mystique of the Japanese Print - is rolling along very well, and reaction from collectors and casual viewers alike has been excellent. It seems that I really 'hit the spot' with this one, on a number of counts: the varied and interesting content, the timing of (about) one per month, the very reasonable price (no, make that the astonishingly reasonable price! ), and the combined storage/display concept that I created. I think also, that the 'surprise' aspect of the series - collectors never know what is coming up next - is a major 'charm point', and this is interesting. People are not usually willing to buy things sight unseen, but it seems that my collectors are still willing to trust me. I suppose my track record is long enough by now! As I write this, I am working on print #15 (at the right is an image of one of the blocks, partially carved), and that means that there will only be three more; the series will wrap up with #18, around the end of the year. I haven't (yet) the slightest idea what I will do next. Our current climate of economic uncertainty would seem to suggest that I produce something 'affordable', perhaps along the lines of this current series, but I would also very much like to create some prints on a more substantial scale. If you have any ideas about this, or suggestions for potential projects that I might undertake, please share your thoughts with me. Thank you for your support! Although it seems hard to believe, it has been a full ten years since I first set up a webcam in my workshop so that people all over the world could 'watch' my work through the internet. I knew - from the feedback I received over the years - that this was much appreciated by the viewers, but because of technical limitations (the slow internet connection I had back then) the camera didn't broadcast full video, but only showed 'snapshots' of the workshop scene. A couple of months ago though, I was finally able to upgrade it, and if you visit the webcam site now while I am working, you can not only watch every motion in real time, you can listen to the sounds of the workshop (and the river! ), and you can even 'call' my workbench and chat with me as I work. The phone-in system allows multiple connections at once, and the other day I found myself in a four-way conversation with collectors in Kyoto, Oregon and Tennessee. Fun! We've had a number of short and simple news updates; now for something you almost certainly haven't been expecting. After more than two decades of running this printmaking workshop completely as a 'one man show', from last month I have been sharing the space with my first employee. Meet new printer Mrs. Yasue Tsushima! To explain the why/how/what/etc. 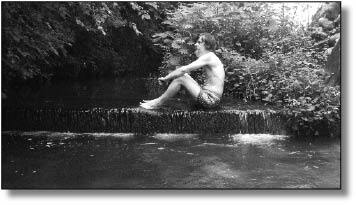 of this I have to step back a little bit, to the 'old days'. Back then, when woodblock printmaking was an integral part of this society, work of many levels was available, from complex ukiyo-e right through to small items of daily life (wrapping papers, etc.). This meant that there was always plenty of work available for beginners. The workshop master would start them off on the simple stuff, and then feed them more difficult work in accordance with their developing skills. That system disappeared long ago though, so where are the skilled printers of tomorrow going to get their start? It seems to me that there is only one way to go; I am going to try to re-build the old system, by creating a wide range of woodblock items under my Mokuhankan 'brand', thus providing a ladder up which would-be printers can climb. So here is where it starts. I have made arrangements with a local Japanese confectionery shop to use Mokuhankan's new woodblock printed kakegami (wrapping paper) for his confections, at no cost to him. He will keep a supply of the wrappers in his shop, and offer them to his customers as an 'option': when they pay 100 yen extra, their confection will be wrapped in a hand-carved hand-made woodblock print. 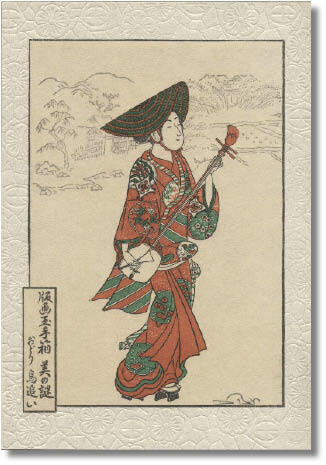 A real woodblock print - and a huge increase in the 'gift value' of the confection - for just 100 yen. The 100 yen of course comes back to us, and goes toward the cost of producing the prints. And that is where Tsushima-san comes in. It has been just over a month since she started coming here (just a couple of days a week, a few hours at a time), and yet she is already producing work for sale. Wrapping papers she has printed are - as I speak - already on their way to customers of these confections all over the world. Yes, you can get these sembei cookies from the Mokuhankan online shop! 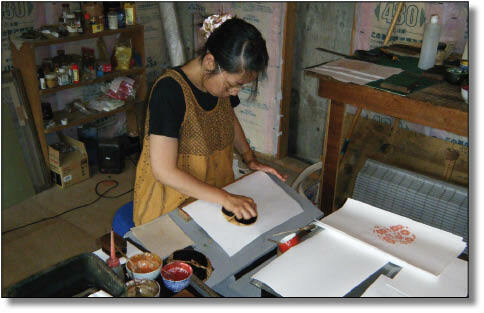 Although she had no previous experience with printmaking at all, she has turned out to be very good at it, and I can see already that it will not be very long before I have to solve my next problem. As she 'moves up' to more complex Mokuhankan projects, I am going to need to hire another beginner to produce the wrapping paper. In the meantime, if you know of any shops who may wish to climb aboard this project, please ask them to get in touch with me. 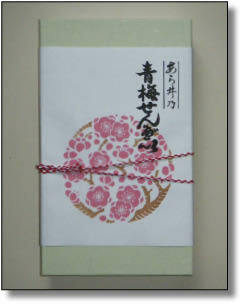 Tsushima-san and I will be happy to discuss creating a custom wrapper for them! Have you had enough Mokuhankan news? Not me ... there is plenty more in store! And I mean that literally! Although my personal printmaking projects have moved steadily forward for many years, the Mokuhankan venture that I began a few years ago has been able to progress only very slowly. This is because the resources available for it - time and money - have both been in very short supply! Even now, with new Senshafuda prints being added to the catalogue every few months (not to mention the new kakegami), growth is still very slow indeed. A couple of months back, I had an idea. What if I were to approach other print suppliers - people whose work I knew and trusted - and suggest that we work together to bring their prints to the market? They would gain by having the international exposure I could provide, and I would gain by having Mokuhankan become a much more interesting and varied place to shop. So I decided to explore this idea, and am pleased to report that Mokuhankan now has three 'partners'! 1) Prints from the oeuvre of the late Toshi Yoshida, newly produced by my friend Shinkichi Numabe, one of the most respected printers working in the field today. 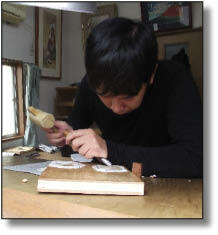 He works under the direction of Toshi-san's son Tsukasa to create these prints, of course using the original blocks. 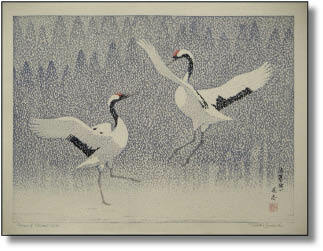 The image of two cranes on this page is just one example, and there are going to be more than 50 beautiful Yoshida prints available. 2) Prints from the inventory of the Takumi Hanga Workshop (the place where young Senshafuda carver Sato-san is currently training, under Mr. Motoharu Asaka). They have a very interesting mix of items, some newly produced, and some supplied from the remaining inventory of the now defunct Takamizawa Company, one of the finest of the old print publishers. 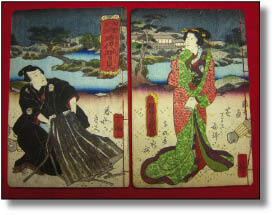 For the most part, these are classical ukiyo-e reproductions, but they will be providing me with more modern work too. 3) Rare books and prints supplied by my friend Shingo Ueda, who is a licensed dealer in kobijutsu (arts/antiques). He attends the private dealer auctions in the old book district of Tokyo every week, and frequently comes home with all manner of interesting treasures. He is going to share with me some items he feels would be of interest to Mokuhankan customers. Now this is a huge expansion of my little venture, and it is going to take quite a bit of time to get this up and running smoothly. These prints will be appearing in the online catalogue bit by bit as I find time to do the necessary behind-the-scenes work. 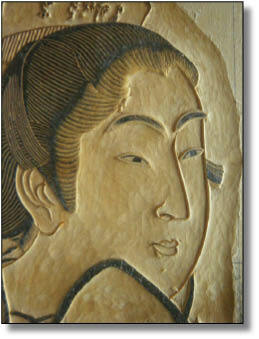 Please make a habit of visiting the Mokuhankan website now and again to see what new items are being featured. You'll see these three new categories listed in the menus, and I hope you will find something there worth collecting! Don't do it on a rainy or cloudy day. Do it if the weather is fine. What on earth is that activity? Actually these items are designed for use in emergency situations, and I did purchase them for that purpose, but because it is quite possible that I wouldn't be able to remember where I had stored them if they were suddenly needed, I have chosen to use them on a daily basis. After sunset I head upstairs again to retrieve my three 'weapons'. I put the fan by the window to help bring in the cool evening air, and set the lights to illuminate the corridor and stairs. I admit that I am saving only a meager amount of energy this way, but this routine has really made me think about our modern conveniences. We are so blessed with handy systems. One flick with a finger allows us to not only turn on lights but even to wash clothes. I used to flip those switches so casually and thoughtlessly, but recently I have been hesitating - asking myself if this really needs to be on. I think that I used to turn on many more lights than was strictly necessary. It is unnatural and unhealthy to make rooms very bright in evenings. Since the nuclear accident caused by the earthquake in March saving electricity has become vital all across Japan. Many new ideas for saving electricity have been introduced, and we are encouraged to do such things as switch our traditional bulbs to LED lights, turn down the TV's brightness, and so on. I guess people who speak highly of nuclear power would be against this, but I am not willing to accept the use of life-threatening methods in exchange for convenience. To threaten my own life would be my own choice, but we have no right to threaten the future life of small children. I think that leaving our debts to the next generation is unpardonable. Considering all these things, I feel it is necessary to act in some way even though the efforts may be quite negligible. One day recently on an errand in Shinjuku I passed a pachinko parlour. Ice cold air was blasting out from the open entranceway, together with the cacophonic music. The incongruity made me angry! But what good does it do to get upset? After all, I have no special power to change society. So I will continue to do what I can, even though it is only for self-satisfaction. Some people will behave considerately, while others will not. It's beyond my power to change how others behave, but I can try to belong to the former group. The enemy that I will be able to vanquish is the one inside me! OK, enough already with the prints and the work. Time for a bit of play! I have been in my home here in Ome for just over ten years now, and this is long enough for me to learn more about the 'cycles' of life in this neighbourhood. One of the main attractions of this place to me when I was considering the purchase was the presence of the little river at the back of the properly. I bought the house in winter, so the river was very low, not much more than a dribble actually, but when the spring rains arrived I learned that for much of the year, it bursts with life and activity. And when the summer weather arrives, my lunchtime routine alters to match. I put my lunch and a drink into a little bag, head down the stairs below my workshop, then wade through the water to a small weir just a few meters away. This is completely surrounded by greenery, and makes a wonderfully private place to relax for an hour or so. I nibble my lunch, toss a few crumbs to the fish, and then - if the weather is really nice and warm - I join them for a bit! (Unfortunately, none of the bigger ones will come close enough to have their picture taken!) It's still a bit hard for me to believe ... this is Tokyo!